Movie stand-ins usually do a decent job of mimicking the celebrities they double. That’s not quite the case with today’s Nice Price or Crack Pipe Delor…I mean Bricklin. Let’s see if this weird BttF homage has you trippin’ over its price tag as well as its flux capacitor. Living is easy with eyes closed, Misunderstanding all you see… You know, I think John Lennon really captured the essence of Range Rover ownership in his song, Strawberry Fields. I mean, you don’t ease into the Range Rover experience through patient deliberation and methodical analysis of the pros and cons. No, based on its unflattering reputation, this is a marque that requires snap judgement and blind devotion. There was little of that aimed at yesterday’s 2006 Range Rover HSE, despite the fact that it seemed to have dodged the ‘knowing the service manager on a first-name basis’ demands usually associated with the marque’s products. At nearly 300K, that Range Rover had shown itself capable of piling on the miles, and that made it unique. Sadly for the seller, it apparently wasn’t $4,900 worth of unique, and it went down in a 74 percent Crack Pipe loss. Did I say that Range Rover was unique? Did I aver that to be true? Well, please allow me to adjust my notion of that concept, because today we have for you a 1975 Bricklin SV-1 that’s about to eff-up your whole world view. There is some reason to think this is not all that crazy. The Bricklin SV-1 and DeLorean DMC-12 did share a number of intriguing similarities. They both rocked iconic gull-wing doors. Both featured a long-nose, short tail style, and each was created by a singular visionary egomaniacal enough to anoint his creation with his own surname. Oh yeah, and both were pretty big flops in their time. But that was back then. Now it’s time to come back to the present and have a look at this weird homage to the most iconic movie car since Herbie, the Love Bug. The work that has been done to the Bricklin is admirable, both in its conception and execution. Talk about sticking to an obsession. The big bumper in the nose (the Bricklin’s model name did stand for Safety Vehicle 1) has been replaced with a quartet of rectangular sealed beams and a horizontal grille. Below that is a neckbearding illuminated panel. That is to be continued out back, reaching up and over the hatch. Trumpet ‘exhausts’ and a denuded spare wheel are bracketed in what was once the back window just behind that. 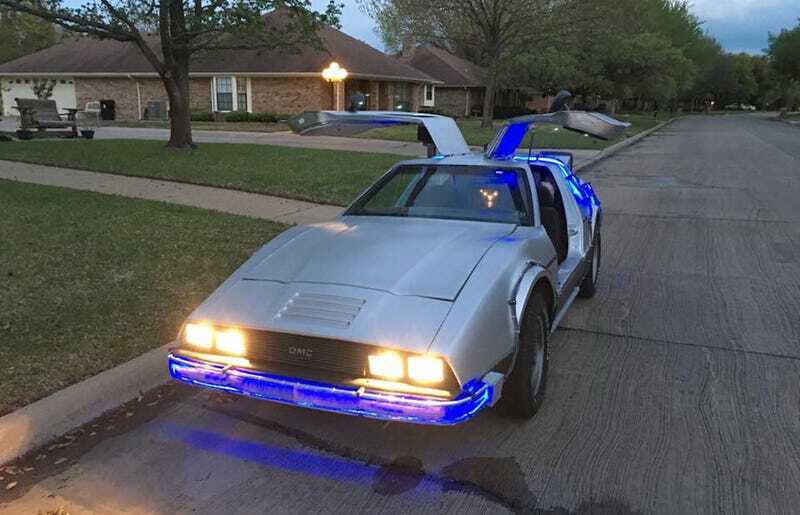 The whole car has been painted silver, to mimic the DeLorean’s stainless steel body. Of course, underneath that paint the Bricklin is all fiberglass. We don’t get much of a look at the interior save for a single shot of the ‘flux capacitor.’ That is surreally is signed by comic and Freaks and Geeks alum, Tom Wilson. She tends to run a little hot but is getting better the more I drive. No Leaks and doesn’t burn oil. Straight pipe dual exhaust to the back. Of course, a car like this isn’t about the journey, it’s all about the destination, that eventual stopping point where you would inevitably be mobbed by crowds seeking pictures or just wanting to know why you’re messing with their treasured movie memories. What might such deviltry be worth? Well, the seller is asking $15,000 for the pleasure. 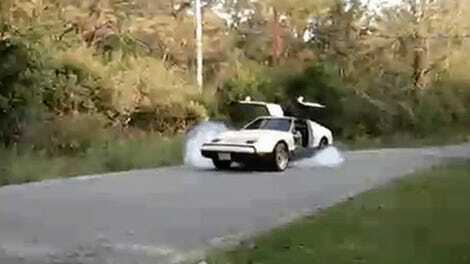 He’s also open to trades for a REAL DeLorean but then, don’t you think he’s done enough with this Bricklin? While you’re mulling that over, let’s take a look at that cash price. Do you also think the seller should get $15,000 for this effort? Or, does that price have you wishing you could go back in time and head the whole thing off? Facebook Marketplace out of Texas, or go here if you are reluctant to click on a facebook link. H/T to ChewinChocolate for the hookup! At $4,900, Might It Be Worth Lightening Your Wallet For This Mileage Heavy 2006 Range Rover?